The Municipality of Kincardine may be host to a state-of-the-art mountain bike part in the foreseeable future. Local riders Drew Otterman and Dave Melanson, gave a detailed delegation on the park to council on June 6, which would wind through the 20-acre parcel of municipally-owned land across from Inverhuron Provincial Park. The land recently had many jumps torn down by Public Works, due to unsafe conditions. Otterman said interest in the sport is rapidly growing, but with few spots to ride locally, many go to Blue Mountain, Hepworth, Brockton's Brant Track or even further distances to find a decent challenge. "We want to give locals a safe, fun and legal place to enjoy and promote the sport," he said. "For tourists, it's a unique way to enjoy the outdoors." The park would feature a variety of specially-designed features for beginners to experienced riders, accommodating the various riding styles such as cross-country, free ride, dirt jumps and downhill. Melanson said 'trail filters' would be constructed and monitored, to ensure riders have the proper skills to ride certain features, lessening the chance of injury. The first phase of the project would see the clean up of the lot, which saw a number of bike jumps torn down by Public Works, due to unsafe conditions. They would also use the International Mountain Bike Association rating system for the track, while establishing rules and regulations to protect riders. The final design would flow across the contours of the land, complete with wooden jumps, paths, a picnic area and a maintenance/utility shed on site. "If we're going to do it, it has to be done right," Melanson said. Construction would follow, with a grand opening upon completion. From that point on, the focus would be on ongoing maintenance and improvements. They are hoping corporate sponsors will get on board with the idea, along with the support of high school volunteers. Counc. Mike Leggett, who originally brought up the idea on behalf of the two men, said liability insurance would fall on the municipality. Counc. Ron Hewitt asked if fees would be charged, but they said the idea would be to have it open to the public, as many young people don't have money to spend on admission on a daily basis. Leggett said Bruce County operates tracks in Wiarton and Brockton, so he's "hoping to get the county on board with this as well". Mayor Larry Kraemer said the county would be a excellent resource for planning and development, as the other parks are already successful. "It would be a great attraction for the municipality," said Kraemer. Council supported the idea of creating an ad hoc committee, under Recreation Services, to study the idea and bring the proposal forward. A new Mountain Bike Park in Inverhuron is exactly what the municipality needs. Local riders Drew Otterman and Dave Melanson gave an excellent presentation to council on June 6 and demonstrated how special and unique projects, such as this, should be approached. They had the topic well-researched, with many examples, photos and videos to give councillors a good idea of what they have planned and the potential such a park could have in the municipality Saugeen Shores has a thriving BMX track, so the possibility of a 20-acre cross-country track could far surpass it, as the diversity of the terrain and location offers far more ability to make it a successful sports and tourism draw. Mountain biking is also something for riders of all skill-levels, although many of the more advanced tracks aren't for the faint-of-heart. It's one of many recreational facilities that can offer children, youth, young adults and the young-at-heart, a venue and outlet to get physical, have fun and compete for prizes and recognition. It could also be the first step for many, who are reaching for bigger and better competition in the world of sport. The land is available, the local interest is here and now all it will take is some planning help from council and Bruce County, who operate successful tracks in Brockton and Wiarton. One more track could only benefit the community, draw tourists and strengthen the already thriving athletics culture in the Municipality of Kincardine and surrounding area. Area businesses, corporations and members of the public should be anxious to jump on the bandwagon for this project. The only place it can climb is up. 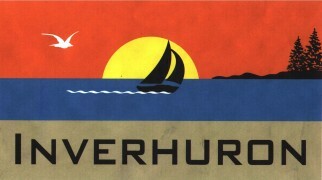 This will be a new attraction in Inverhuron coming next year. 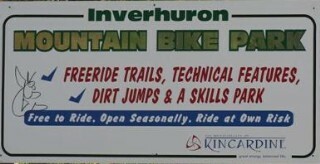 The Inverhuron Bike Park is a go and will be starting in the next few weeks with volunteer days during the summer. The first things for the committee to do on the site is to layout the potential trails, parking lot, picnic area and skills area this is to start April 4 weather permitting. Clean-up at the site of Inverhuron’s future mountain bike park will begin this Saturday. With $40,000 provided through the 2008 budget by the Municipality of Kincardine, organizers hope to get the project at the 20-acre Richards Drive site off the ground this summer. “We hope to start some preliminary trails, a picnic area and a parking lot this summer,” said Council Mike Leggett, who heads-up the ad-hoc committee organizing the project. Leggett said they’re pondering whether to hire a firm to do some of the construction work this summer, in order to get it up and running sooner. The project first surfaced after a presentation last year by local mountain bikers Dave Melanson and Drew Otterman, who approached council about the concept. The two had been riding on the property without permission, so Public Works, through Leggett, told them they would have to remove their equipment. They then formally approached council about the concept. Both now sit on the committee, along with other councillors and interested members of the community. The piece of property, near Inverhuron Provincial Park, is a former gravel pit owned by the municipality. The Inverhuron Bike Park had its' grand opening last August, but it is now open for the second season with some new additions to draw mountain bikers of all skill levels. Phase one was completed with a few trails and jumps last summer, but this summer there are a few more things to do, ranging from an easy trail for anyone to try, to difficult trails for the more experienced biker. Steve Murray, manager of Economic Development and Tourism in Kincardine, says he hopes to have the new additions completed by the end of this summer. Now the bike park has their medium trail completed, and is working on fixing stuff up from last year, finishing off the easy loop, blue square trail, double diamond, and wants to possibly connect to the Provincial Park with a trail. In the park there is a trials area for kids to learn about mountain biking, three levels of dirt jumps, and among the trails are ramps, wall rides and teeter totters for people to try. The park gets steady use, and there are about five to 10 kids a day on average, said Murray. The park held an event on Saturday with a bike skills demonstration, the regular bikers will show kids how to use the park, and proper etiquette when riding and doing tricks. There was music and food and drinks. The winners will be announced on Aug. 27, with the first place winner receiving $100, second place receiving $75, and third place receiving $50. Sponsors of the park are Home Hardware, Jackson Construction and OPG, but the park is still looking for sponsorship to achieve their approximate $16,000 goal. It's closed for the season, but the Inverhuron Bike Park had a very successful season with bigger expectations for next year. Steve Murray, manager of Economic Development and Tourism in Kincardine said traffic was up at the park this summer. At first things seemed slow, but it really picked up after the August long weekend, Murray said. Aside from some maintenance clean ups, Murray said they are looking to replace one of the trail features for its third season next year. The hope for next year is to finish one of the family trails, called the easy loop and do some maintenance to one of the more difficult trails, the double diamond. Murray said, to his surprise, the average age of mountain bike trail users are between 10-15. I thought it would have been older users, but this is great, he said. I've been told they are there anywhere from half an hour to five hours. He said because this feature is so unique to our area, it is well used. Locally, its the closest thing we have to mountain biking, said Murray. It's great. It's better than having these 10-year-olds playing video games inside. The removal of technical features at the Bruce Peninsula Mountain Bike Park could be the first in a wide sweep of restrictions for recreational trails. The cost of insurance is behind forced changes that will close the popular park until mid-summer, said Bruce county planner Chris LaForest. Tourist operators and mountain bikers are upset with the removal of elevated wooden structures that made the Bruce Peninsula Mountain Bike Park a model for the sport, LaForest told Bruce county council last week. The problem is the potential for lawsuits. Municipalities are seen as targets with deep-pockets for a liability settlement in case of an injury by a trail user, LaForest said. Insurers argue that high court awards for injuries are pushing premiums up. "There's been a real chill on municipalities on trails in general," LaForest said. "Unlike other jurisdictions (Ontario doesn't) really have any specific trail legislation that in my mind provides proper protection for municipalities that do have trails." Bruce county Warden Mike Smith confirmed the removal of wooden structures at the highly-acclaimed park near Wiarton is partly driven by insurance costs and issues at the mountain bike park. Smith is concerned about a trend that could limit trail development on a wider scale. "I think we've got some great parks and trails. We've put a lot of effort into building them and making sure they're safe," Smith said. "When insurance costs drive you to make decisions like this it's not good." Clamping down on trail use runs against efforts to promote physical activity. High insurance premiums further limit trail access by adding to municipal costs and raising the price of trail permits for user groups like snowmobilers. "Maybe if we had some insurance reform and liability reform, some of that could go into constructing trails and getting more people out on trails," LaForest said about the portion of trail user fees and costs that now go toward insurance premiums. The answer, according to both LaForest and Smith, is insurance legislation reform that would clarify who is responsible in case of injury and set limits on damages. "I know there's a number of groups that are petitioning the province to look at limiting that liability," Smith said. "It's an issue that all municipalities deal with -you've got to balance what you build against taking on a whole lot of risk and a whole lot of cost in insurance." 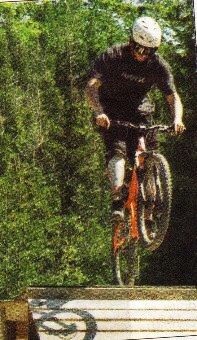 The Bruce Peninsula Mountain Bike Park cost about half a million dollars in labour and materials. It was built under experienced leadership to standards set by the International Mountain Biking Association. LaForest estimates it will take about $20,000 to remove elevated wooden structures, replace them with a dirt "pump track" and enhance existing single- track trails on the property. The entire bike park will be closed until mid summer while that work is in progress, but the county's three other bike parks remain open. They are located int the Brant tract near Paisley, the Mildmay track and the Lindsay tract on the Peninsula, and together offer 72 km of bike and walking trails. 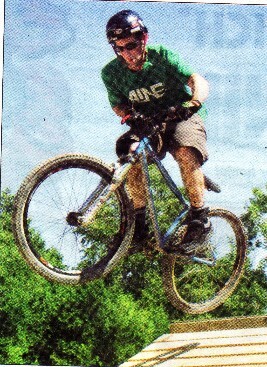 After three years of blood, sweat and bicycle spills the Inverhuron Mountain Bike Park is complete... at least for now. About $100,000 has been spent from both donated and municipal funds on labour, materials and signage for the 21-acre park, located on Richard's Drive, east of Inverhuron Provincial Park. Economic Development and Tourism manager Steve Murray said the Municipality of Kincardine Parks and Recreation department will soon be taking over maintenance of the facility from contract staff.
" Three and a half years later, look where we are," Murray said. An average of 20 or more riders per day have frequented the park this year and committee member Drew Otterman said they expect more as word spreads. The 10 trails vary in difficulty from beginner to ' Diamond' and ' Double Diamond' ratings under the Whistler Trail Standards. There are also numerous 'Jackson's Jumps' dirt areas and many other features that have been established this year. Skilled trails, practice trails, wooden 'skinnies' platforms and teeter-totters await riders. "As they get worked in they get better," said committee member Drew Otterman, who with Dave Melanson were the original riders to approach council with the concept. "You need tires on them to get them settled." The park has also garnered attention from exposure in the Inverhuron Park guide, as a destination for campers to enjoy right across the road, Otterman said. Although the planned trail system is complete, Murray said new features could still be added or changed in the years to come, to fit the needs of riders. The bike park is open from dawn to dusk each day to riders over 14. Riders under 14 are to be accompanied by an adult. Helmets are mandatory and protective equipment is recommended.